Adding color to the image really highlighted the tracks left by the bouncing boulder, and a few other tracks showed up as well, creating an absolutley awesome image and discovery! Also, check out Stu’s pictoral history of the International Space Station, starting from when it was a wee infant back in 1998 to the great images we’ve seen of the ISS this past week. i second the naming after Stuart Atkinson. The man who lost the sea – theodore sturgeon. A must read. A short story about the first man to walk on mars. Hmmm… “boinging boulders”. That sounds like a good name for a band. Anyways, good find! These pictures are pretty awesome! Amazing work!! Awesome pics!! Great article!! Started out with a laugh this morning – “boinging boulders”, I like that! Beautitul and interesting pictures, thanks for pointing them out. 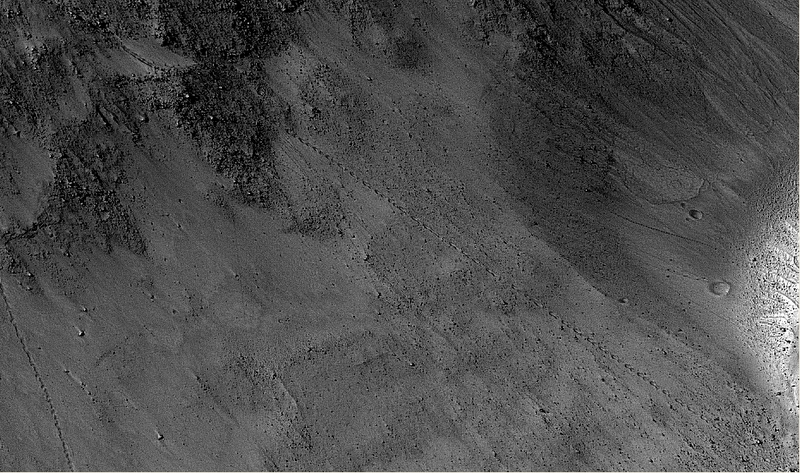 One of the things that I’ve always struggled with is scale – as it relates to images from Mars. After all, you can’t place a ruler down of an automobile for comparison. For example I wonder just how large that section of wall is that dislodged from the side of that slope? Mind games. Enjoyed the pics, thanks.